As promised here are the 2 white on white cards I promised. I have greatly admired the multi layered and textured designs as seen on Becca's site. 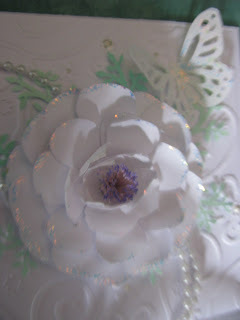 I used a cuttlebug embossed folder, Martha Stewart butterfly punch, my favourite L-Em fern leaf punch which sadly jammed up on the day and a Carl Retro Punch for part of the rose... the rest of the rose, I handcut to get the larger size I wanted. Pearl rope was added and Kindy Glitz finished off the rose and the butterfly. 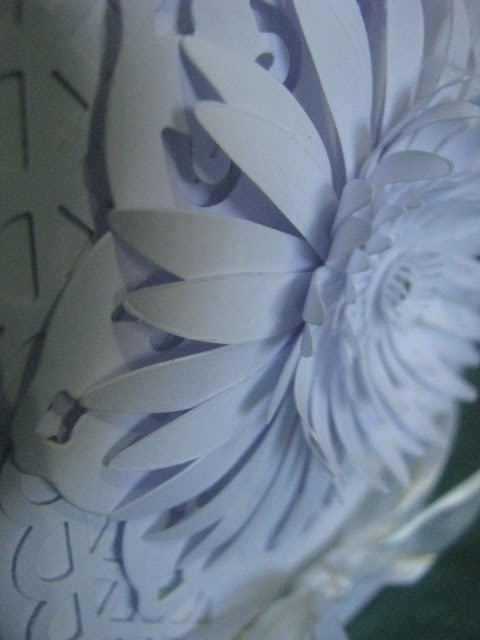 BTW the stamens is a fringe flower insert in the middle! The next card is my daisy, though when I look at it and it makes me think of a water lily. What do you think it more resembles? 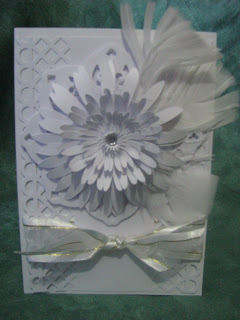 For this card I used my newly purchased Martha Stewart Deep Edge punch which is quickly becoming my favourite border punch! The daisies were die cut on my cuttlebug using Sizzix Bigz Daisy Dies. Ribbon and feathers were from my stash! I wonder if I went overboard with the card... it can be hard to know when to stop sometimes! Oh well, I like it and it is done now. 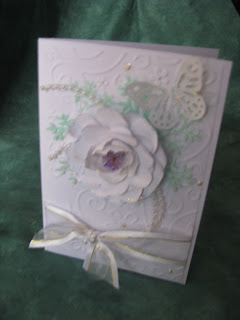 All four of these cards as well as many others are available for sale on my Zibbet Shop: Inkspirational Designs.